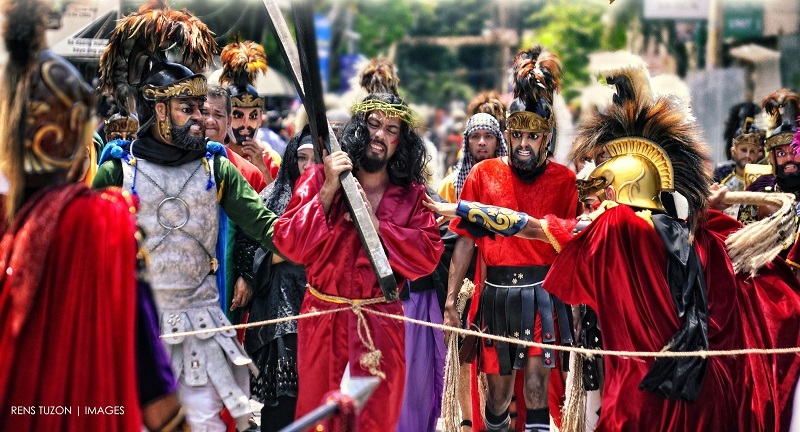 The Moriones attract devotees and drifters alike to Marinduque every Holy Week. We take a look at one of the liveliest festival of the solemn holiday. Marinduque claims to be the country’s “Lenten capital,” and the Moriones Festival is its unique and celebrated take on Christ’s suffering and death. Moriones comes from the Spanish word “morrion,” which means “helmet” or “visor.” In this centuries-old tradition, local men (and a few women) put on the colorful garb-the highlight of the gala costumes are finely carved masks depicting the fierce Roman soldiers of Christ’s time. The morions then populate the towns ‘streets-engaging in mock swordfights, playing pranks on children, marching or dancing in groups, or performing antics while safely hidden behind their masks. The masked and costumed penitents march around Marinduque’s six towns for seven days searching for Longinus. The celebration starts on Holy Monday and ends on Easter Sunday, when the story of Longinus is reenacted in a play. Biblical accounts identify Longinus as the Roman centurion who pierced the side of the crucified Jesus. Blind in one eye, he regained his sight after blood and water from the side of Jesus cleansed him. Converted after the miracle, he went about town proclaiming Christ’s resurrection. This enraged the Roman leader Pilate and the Pharisees, who ordered Longinus arrested and beheaded. The Moriones tradition was reportedly begun in 1807 by Father Dionisio Santiago, a parish priest of Mogpog town. Father Santiago wanted to inculcate a sense of understanding of the life of Christ by reenacting the last few days of his earthly life, which culminated in his crucifixion. Mogpog was then a barrio of the capital Boac. Boac emulated the ritual, and so did Gasan, another barrio that eventually became a municipality. Today, the Lenten ritual is also observed in the town of Santa Cruz, Torrijos, and Buenavista. According to historical accounts, the Moriones tradition was suppressed by the Japanese during their brutal occupation. They feared that guerrillas would be able to move freely around the province as masked actors in this festival. Thus, the municipal government started the process of registering participants for a small fee. In the 1960s, then education secretary Alejandro Roces, invited as guest speaker of a high school graduation in Gasan, witnessed this beautiful, strange by what he saw, Roces, who had been going around the country recording its varied cultures and traditions, returned for the next three years, bringing with him writers, painters, artist, and journalist to record and promote this remote island’s cultural treasure, enjoyed only by the locals. This eventually led to its evolution into a lively festival that brightens up Lenten sobriety. But under the gaiety, the people behind the mask are actually fulfilling vows of penance, giving thanks, or performing acts of self-cleansing. Morions endure as a form of sacrifice. They experience hunger and thirst, long marches, and the burden of heavy headgear and hot costumes, all under a sweltering sun. After long and humid days, the costumed penitents join the early evening processions on Holy Wednesday and Good Friday. The Moriones tradition was said to have inspired the creation of other Philippine festivals that turn cultural practices or folk history into street festivals.